Preble's meadow jumping mice deserve their name: By using their strong hind legs and (relatively) big feet, the three-inch mice can jump more than a foot and a half into the air and can leap three feet horizontally. Their long tails are used for balance. Naturalist E.A. Preble captured the first Preble's meadow jumping mouse in an irrigation ditch near Loveland, Colo., in 1895. 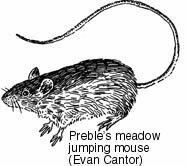 When studies in the 1950s proved that the mouse was distinct from other meadow jumping mice, the new subspecies was named after Preble. There are 12 subspecies of meadow jumping mice. The subspecies is very difficult to study, since adults hibernate from September through May. Juveniles stay active a few weeks later and emerge slightly earlier. Preble's mice build underground nests of grasses and leaves on moist streambanks, using willow thickets for protection from predators. They're usually active at night, when they forage for seeds, small fruits, fungi and insects. They are almost always found within a few feet of streams. Like all meadow jumping mice, Preble's mice reproduce often. Between early June and mid-August each year, adult female Preble's mice have two to three litters; there are five to six young in a litter.